While Christmas is usually the main event in the West, New Year's is the centerpiece of the winter holidays in Japan. In the middle of the cold, you'll find the best time of the year to feel the warmth of Japan, whether it's the gathering of family, endless meals of traditional Japanese food, or visits to shrines. A standard New Year's celebration begins at home, and as New Year's Eve approaches, families gather at shrines and temples to pay respects by praying for the upcoming year, known as hatsumode. People may actually visit the shrine for the next several days, and even wear a kimono. The previous year's amulets, known as omamori, are blessed by the monks with luck and good fortune and burned to show respect for the deities. Burning the amulets at the beginning of each year marks the beginning of a new cycle. People may also write a kakizome, or “first writing” of Japanese calligraphy written for the New Year often with simple phrases or words to pray for a good year. Once home, families prepare osechi, a traditional Japanese meal served in a layered box. Each stacked box is decorated in red and gold, and holds a variety of dishes representing joy, health, family, and good fortune. On New Year's Eve, it is also typical to eat toshikoshi soba, which literally translates into “New Year” soba noodles. The noodles are believed to bring good fortune. Preparation styles vary from region to region throughout Japan. If traveling around to be sure to check out different styles of these delicious noodles. After celebrating New Year's, couples and families often travel to a ryokan, traditional Japanese hotels to enjoy a relaxed time served with full course meals and of course the onsen. During the winter season the ryokan is a particularly popular destination. Hakone and Kyoto provide beautiful getaway spots for Japanese and tourists alike. The onsen, a public bath space for people to dip and cleanse their bodies in a warm bath, may be intimidating for newcomers. Outdoor onsens are surprisingly one of the most relaxing experiences. Surrounded by snow, many enjoy the beautiful scenery. 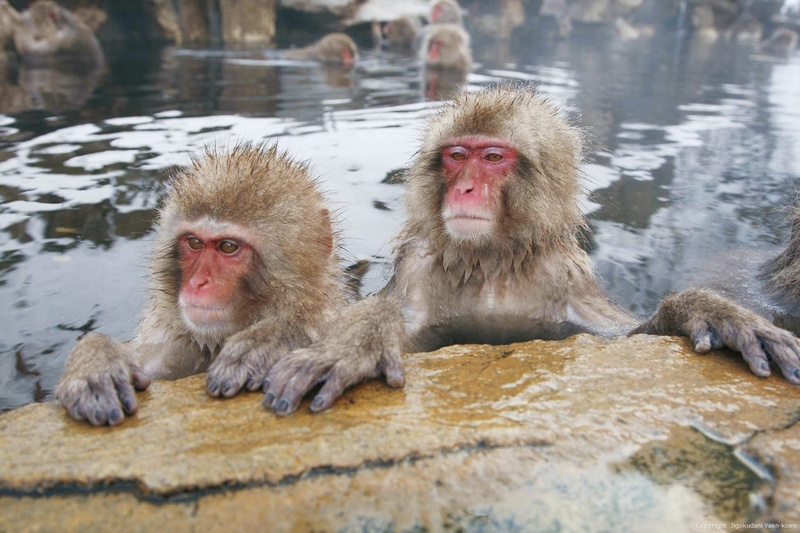 Not only attracting people, the onsen are even a must for Japanese macaques, which can be seen in zoos and in the wild. Some ryokans even provide a bath for these wild critters to relax in their waters. Maybe onsen isn't what you were looking for? No worries; there are plenty of breathtaking winter illuminations and snow festivals throughout the country. Illumination shows and events are hardly uncommon in Japan, and numerous cities create dazzling light displays to light up the hearts of the viewers. Traveling up north to Hokkaido, the famous snow festival provides a chance for everyone to see a variety of elaborate snow sculptures. Back down to Kamakura, there are snow huts that can be enjoyed and even to offer warm hearty meals inside! 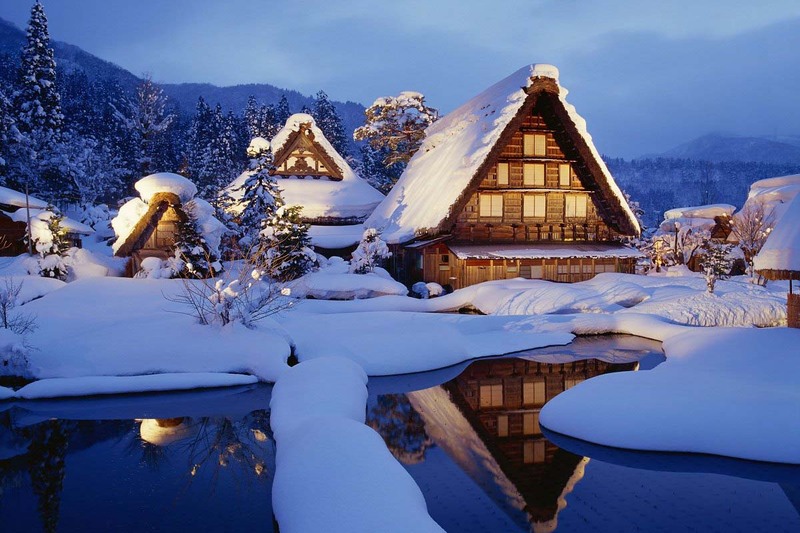 The snowy region of Kyoto is also a beautiful destination to enjoy Japanese winter traditions. At the heart of Japan, Kyoto offers a variety of essential cultural experiences. Kinkakuji Temple, gold and topped with snow, is a rare and spectacular sight to see. The streets of Kyoto are lined with all types of food, ranging from sushi and noodle to hot-pot style nabe, broths filled with seasonal vegetables and meat. Wherever you go in Japan, there are just too many wonderful regional cuisines to enjoy, so come with an open mind and an empty stomach to enjoy the holiday scene with all its delicious food! Full of traditional dishes, traditional New Year’s celebrations, and beautiful scenery in the snow illuminated by the cheer and good fortune, Japan’s winter holidays embrace all the holiday spirit for all to enjoy. The winter season is a time to fully enjoy the Japanese holiday traditions and will always make for a memorable experience for all.